I wasn't able to attend the party, I wated to, but the game crashed when I tried. 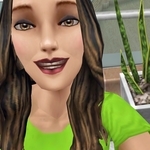 Feel frustrated as some of the sims mine were friends with, even had started stories with, have disappeared off my lists. I met some at a party and they were back to stranger or acquaintence and I had to start over. It may be because I don't retire my sims and they have a lot of friends. If there is a limit, I wish I could choose which to delete - like the retired ones, which seem to stay on the list forever, although grayed out. Did those sim's stories also disappear? I thought as long as you had stories with the sim you could still call that sim over to sticker and interact even if they were removed from your contact list but if the stories also disappear that's very frustrating. I thought so too, but I swear of my sims had started stories with each of Erin's new sims, and they're not in any sim contact list, for example. And I had to restart relationships with Constance and Corey. Does anyone need any stickers? Sorry for the late reply. I was good for last week. Guilty me. Since it's no longer required in the to-do list. I dont give as much stickers as before...Lazy me! Neither do my sims change clothes as much.